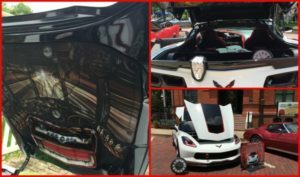 The Big Cypress Corvette Car show comes to Jefferson in East Texas for one weekend in June every year. It is June 1-3, 20176. Jefferson is a perfect place to enjoy these beauties glimmering in the sunshine. Feel free to stroll up and down the streets visiting with the owners and enjoying their fanciful paintings on and inside of the cars. Wow do they have some incredible paint jobs. The painted details on this car were amazing to see. Be sure to look under the hood and in the trunk, you might be surprised at the little details. There are awards for the oldest corvette, traveled the farthest, trophies in all classes of C1-C7 including wide body and so many more. The Time Traveler was my absolute favorite. Also on Friday night there will be Karaoke at The Franchise downtown. And to top off the event stick around for a fun evening, the Krewe of Hebe is having a Crawfish Boil in the Beer Garden downtown. Remember to bring your cameras, you will want to take plenty of pictures of these gorgeous cars. And when you feel the urge to eat, pop into any of or tasty restaurants to wet your whistle and tame that hunger. 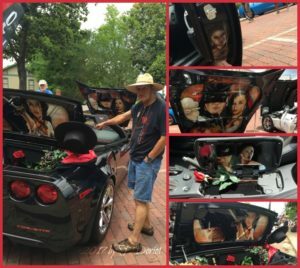 This entry was posted in Car Show, Summer Events by Tammy D. Bookmark the permalink.